Animals try to exaggerate their body size in a variety of ways to dissuade predators; the simple body shape of snakes limits the ways in which they can do this. One of the most common solutions -- seen in hundreds of species -- is to flatten their bodies to appear larger than they are. In some species, this flattening ability is limited to the neck region, as it is in cobras, hognose snakes and false water cobras. Body- and head-flattening behaviors may be the most widespread defensive mechanism of snakes. From the harmless 12-inch-long brown snakes (Storeria spp.) of North America to the large and highly venomous tiger snakes (Notechis spp.) of Australia, body flattening is a widespread behavior. While some snakes that hood, flare or flatten are capable of backing up such bold displays with deadly venom, many are essentially harmless, and the behavior is a high-stakes bluff. The neck-flattening displays of some species -- for example keelbacks (Rhabdophis spp.) and painted bronzeback snakes (Dendrelaphis pictus) -- reveal the brightly colored skin between their scales, increasing the shock value of the display. Cobras -- particularly those of the genus Naja -- exhibit the most distinct hoods among snakes. Different cobra taxa exhibit varying hood sizes and shapes: Indian cobras (Naja naja ssp.) display relatively round hoods, while king cobras (Ophiophagus hannah) and shield nose cobras (Aspidelaps spp.) have long, narrow hoods. 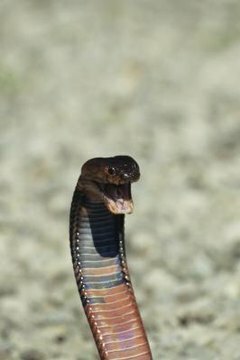 Some cobras have evolved the ability to spit venom, though they may not always display their hoods before spitting. Perhaps unsurprisingly, many of the relatives of cobras display rudimentary hoods. Black mambas (Dendroaspis polylepis) of Africa and king brown snakes (Pseudechis australis) of Australia are both large, highly venomous elapids that spread a narrow hood as well. South America is home to several species called false-water cobras (Hyrdonastes spp.). These occasionally large, semi-aquatic snakes display rudimentary hoods. Among North American snakes, it is the hognose snakes (Heterodon spp.) that possess the most well-developed hoods. Unlike cobras, hognose snakes usually display their hoods horizontally rather than vertically. If hood displays do not dissuade predators, hognose snakes will roll over and play dead. While neck-flattening behaviors usually work by flattening a snake’s neck from front to back -- as in cobras -- some snakes flatten their necks from side to side. Often snakes that display in this manner turn to one side, to ensure the predator gets a full view of the flattened neck. In some species the neck is inflated rather than flattened; however, the end result is the same -- their necks look larger, making the snakes look more formidable. Red-tailed green rat snakes (Gonyosoma oxycephalum), common tree snakes (Dendrelaphis punctatus) and many other species exhibit some sort of neck display.